A pleasant and non-invasive treatment of the ears, used to treat a variety of conditions such as: Excessive or compacted wax in the ears, irritation in ears, sinusitis / rhinitis (Chronic Nasal and Sinus Dysfunction) glue ear / migraine / sore throat, hearing impairment. The relaxing & calming effect eases cases of anxiety and stress, noises in the ear, ringing, tinnitus, hay fever, catarrh, asthma, and pressure in the ears & head. When lit, ear candles work by vaporising their ingredients and creating air flow towards the ear. Induces a revitalising heat upon the ear, which soothes, relieves and relaxes by the flame creating a negative pressure encouraging the contents of the ear to be drawn out. The person is protected from heat and falling debris from the candles by the practitioner placing the candle through a paper plate which collects the materials before it can fall onto the person. 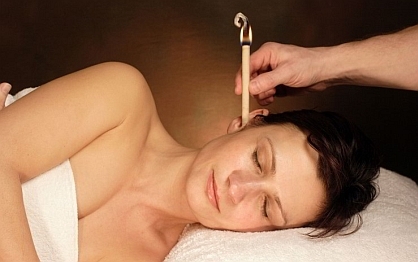 For further details about Ear Candling Contact Us.